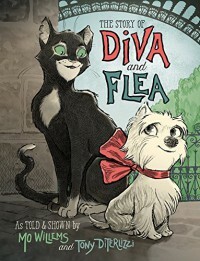 Two unlikely friends embark on a life altering journey in The Story of Diva and Flea by Mo Willems and Tony DiTerlizzi. Diva is a small dog who lives in an apartment complex at 11 avenue Le Play in Paris, France. She takes her job of guarding the courtyard very seriously. Flea is a streetwise cat who loves exploring the city of lights. One day, his travels take him past 11 avenue Le Play...and Diva. He finds the petite pooch to be quite interesting. Flea cannot understand why Diva runs away every time that someone enters the courtyard. A miscommunication soon turns into a budding friendship. Diva loves listening to Flea's stories about the wondrous sights of Paris. She admires his bravery and courage and decides to become an explorer too. Does this curious canine have what it takes to make it on the streets of Paris? Can Flea conquer his fear of brooms and the humans that come with them? Most importantly, will Diva and Flea's friendship survive despite their vastly different backgrounds? I absolutely love this book! The story reminds me of a mixture of Disney's Oliver and Company with a dash of Madeline. While I have not been to Paris, I can definitely relate to the bond that Diva and Flea share. My husband and I rescued a two week old kitten from the middle of main street in our town and our three-legged dog, Penny, immediately bonded with the kitten and began raising her. This story has so many fantastic themes woven intricately within the chapters. I also love how the story is told from both Diva and Flea's perspective. It is truly magical to see how their individual lives come together to create a relationship that each hadn't thought possible. Tony DiTerlizzi's illustrations are enchanting. Readers of all ages will fall in love with the adorable Diva and Flea. I am also blown away by the detail that DiTerlizzi puts into each image. His buildings are simply incredible! I almost felt as if I was in Paris, smelling the scent of coffee and freshly baked bread. 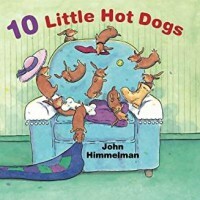 I would highly recommend this book to readers ages 8 to 108! This classic story of friendship, courage and discovery will surely be treasured for years to come. I think it would also make for a fantastic movie or television series. Plum cannot believe her eyes! Sam and Gracie are now the very proud owners of a CAT! She is certain that no good can come out of this new addition. Especially when Binky begins to follow her everywhere. What is this poor pampered pooch to do? Is it truly possible to be friends with a cat? Is there really plenty of love to go around? I was very excited to read the second installment in the Plum series and I was not disappointed. Clark deals with the complicated emotion of jealousy from an animal's point of view. I found this found this fresh perspective to be very entertaining as well as educational. The illustrations are whimsical as well as adorable. I love how Plum's eyes are so expressive! I also love that the illustrations are hand drawn. I feel that more and more drawing is becoming a lost art. I greatly enjoyed following Plum on her journey through jealousy. 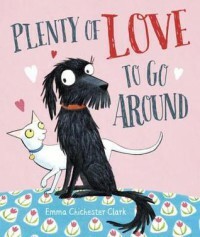 Children of all ages will fall in love with Plum and Binky. This would be a great story to read before adopting a second pet or for parents who are expecting another child. 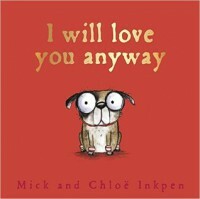 I Will Love You Anyway by Mick Inkpen introduces the reader to an adorable sweatband-wearing pug. This portly pooch cannot seem to behave. He digs on the sofa, makes messes on the stairs and even steals socks! His family tries to teach him manners. But instead of being a good student, the pug runs away. He continues his bad behavior by rolling in poo and even chasing cars! Will this devilish dog be able to change his ways before it's too late? I fell in love with the bug-eyed pug from the moment I saw the cover of the book. Chole Inkpen's illustrations are adorable as well as emotionally captivating. His expressions will put readers through a full range of emotions. I almost grabbed a tissue several time while reading. While I greatly enjoyed reading Mick Inkpen's debut title, I found the alternating rhyming scheme to be a bit complicated. Some of the pages were in perfect rhyme while others were in slant rhyme. This makes reading the story out loud somewhat challenging. Not everyone can be Dr. Seuss. I also have to admit that I really struggled with the ending. Why would the pug continue to run away from the family that he so desperately loves? Why has the family not considered enrolling the mischievous pup in obedience classes? I feel that the story might send mixed signals to very young children. They may end up thinking that they can continue to disobey their parents over and over again without any repercussions because they will still remain loved. 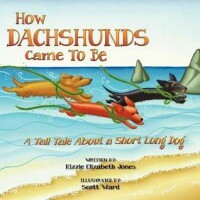 Overall, this book is a great read for children and animal lovers of all ages. Being a fur mom to five rescue dogs and two cats, I can definitely relate to the theme of the story. You might even feel the urge to purchase sweatbands for your own fur babies. Paws Up for Fuddles and Puddles! 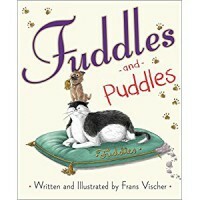 Prepare for adventures of the furry kind in Fuddles and Puddles by Frans Vischer. Fuddles is a very fat and spoiled cat. He spends his days eating, sleeping and basking in the love of his family. All of that changes when his family adopts a rambunctious puppy. The family names the pup Puddles and he is completely enamored with Fuddles. He follows Fuddles everywhere...including the litter box! The poor stalked kitty can only get a break when the two are let outside to play. One day, Puddles takes things too far by eating Fuddles's food. Fuddles decides to lay down the law. Puddles soon learns to give Fuddles his space. But what happens when the friend Fuddles didn't want becomes the friend that he desperately needs? I simply adored this story from start to finish! Being the proud fur mom to five dogs and two cats, I can definitely relate to the tensions that develop when a new pet is brought home. The illustrations are gorgeously adorable. I was quite surprised to see a two page spread illustration. Vischer was able to beautifully convey an emotional scene through stunning illustrations. I highly recommend this book to readers and animal lovers of all ages. Anyone who has ever owned or fostered multiple pets will totally be able to relate to this fantastic tale. The characters of Fuddles and Puddles are sure to enchant and delight both young and old. Everyone's favorite Frenchie is back in Naughty Mabel Sees it All by Nathan Lane and Devlin Elliott. Mabel urgently greets the reader even before page one! She wants to make sure that her side of the story gets told. 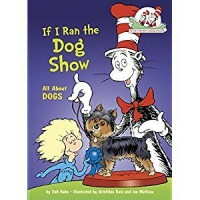 If I Ran the Dog Show All About Dogs by Tish Rabe introduces children to the wonderful world of dogs. With the Cat in the Hat as their guide, a little boy and girl set off to the dog show. While there, the children learn numerous facts about dogs. What Cat is That? 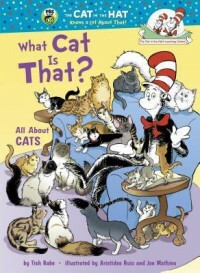 All About CATS by Tish Rabe introduces children to the wonderful world of cats. With the Cat in the Hat as their guide, a little boy and girl set off on a journey around the world in a Kitty-Cat-Copter. They meet lions in Kenya, tigers in Bangkok and so much more. Along the way, the children learn numerous facts about cats. I absolutely loved this book! The illustrations by Aristides Ruiz and Joe Mathieu pay homage to the great Dr. Seuss and are simply adorable. I also found the facts in the book to be quite interesting. I never knew that there is a breed of cat that actually likes to swim! Or that a group of kittens is called a kindle. I would highly recommend this book to readers and cat lovers of all ages. Readers will delight in the whimsical illustrations and will walk away with an increased knowledge in all things cat. There is even a glossary in the back of the book as well as a For Further Reading section which suggests other books about cats that readers might enjoy. Check it out right meow! Douglas is a dog with a problem. He is having trouble seeing. But, he doesn't know it! His owner, Nancy, can no longer ignore the signs. After a game of fetch goes goes horribly wrong she decides to take Douglas to the eye doctor. Douglas is positive that he can pass the eye exam.....until the doctor tells him that he needs glasses. Will Douglas be able to embrace his new look? I love Ged Adamson's illustrations! His use of water color for the trees mixed with hand drawn characters create truly stunning pictures. I greatly enjoyed this story and can totally relate. When I was in the fourth grade, I literally lost my ability to see things far away in one day. This was a very traumatic experience and this book would have definitely helped me understand what was going on. While I like the story, I feel that it ends abruptly. After Douglas gets his new glasses, the story simply stops. 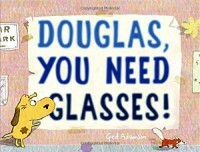 I wish that Adamson would have showed how having glasses has changed Douglas' life. I would have liked to have seen Douglas succeeding in walking in the park and playing fetch. I do feel that this book would be a great gift to any child who is in the process of getting glasses. Douglas is such a lovable character that I know children will adore. 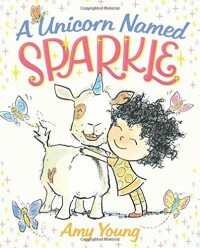 Prepare for a story of mystical proportions in A Unicorn Named Sparkle by Amy Young. A young girl named Lucy discovers an ad for a unicorn that is for sale for 25 cents. She hurriedly sends in her money and eagerly awaits the unicorn's arrival. While she waits, she begins to dream about all of the things that she and her unicorn will do together. Lucy has even picked out her new pet's name: Sparkle. She also prepares a special cupcake treat to present to Sparkle. The unicorn man soon arrives with a large box. Upon opening the box, Lucy discovers that Sparkle is not at all what she had expected. He is unwilling to play dress up or go to show-and-tell. With her dreams shattered, Lucy calls the unicorn man and tells him that she no longer wants Sparkle. When he returns to collect Sparkle the next day, Lucy feels torn. Could the pet she didn't want turn out to be the pet of her dreams? I absolutely love this story! In fact, it may very well be my new favorite children's book. The story is so touching and strikes a true chord with me as I am heavily involved in animal rescue. Too often, animals are passed over due to their looks without anyone taking the time to get to know their personalities. This is exactly the case with one of my pets. Penny is a Chiweenie that was born with a deformed front paw and a severe overbite. No one at the shelter wanted her due to her unique looks. She was going to be euthanized until a rescue group saved her in the nick of time. My husband and I then adopted her and she has been inspiring us ever since. Although she is a tripawd (only has three legs) she can do everything that her four-legged siblings can do. We had incorrectly assumed that she would need extra care because of the missing leg, but all of our misconceptions were shattered when we met Penny. There are so many wonderful lessons in this story. The most obvious is not to judge a book by its cover. Another is that relationships take time to grow. Lucy was expecting an instant love connection, but did not realize that building a relationship takes more than just a few days. The more she gets to know Sparkle, the more she can see just how special he is. I was also captivated by Young's illustrations. They are bright, youthful and charming. Sparkle is adorable! I love that he has a heart shaped spot by his bottom. 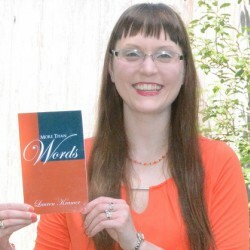 This book is perfect for readers of all ages. Sparkle will tug at the reader's heart strings. I would highly recommend it to animal rescue groups and shelters as part of a humane education lesson. 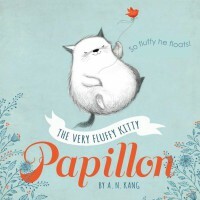 The Very Fluffy Kitty Papillon by A.N. 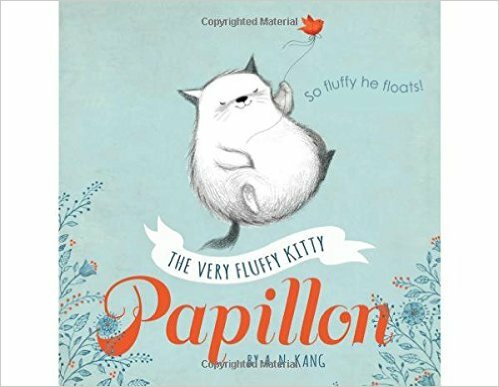 Kang tells the fanciful tail of Papillon, the kitty who is so fluffy that he floats away. His loving owner, Miss Tilly, is constantly worried that Papillon will float away and be lost forever. She tries to weigh him down by feeding him fattening foods. Nothing worked...until she noticed the bowl that had once contained spaghetti setting on his head. This gives Miss Tilly a wonderful idea. She will make clothes for Papillon! Miss Tilly starts with a few simple outfits, but soon gets carried away with intricate costumes. One day, Papillon decides that he has had enough of wearing clothes. Miss Tilly tried her best to reason with him without success. Feeling defeated, Miss Tilly heads to the market. Papillon is enjoying his high floating freedom when he notices a bird sitting on the window sill. He floats over to have a look...and follows the bird right out the window! Papillon did his best to follow his new feathered friend, but he soon finds himself lost. Will Papillon ever be able to find his way back to Miss Tilly? I absolutely loved this story! A.N. Kang's illustrations are simplistic but adorably irresistible. My favorite set of illustrations can be found on page 10. Papillon looks ridiculously cute in his numerous costumes. The shark costume is hilarious! The expression on Papillon's face reminds me of Grumpy Cat. I also like how Kang subtly introduces the reader to Papillon's new friend from the beginning of the story. If the reader looks carefully, he/she will find this friend on every other page in the book. This would make an excellent discovery game for children. This is a wonderful story for children of all ages. I believe that old and young alike will delight in the fun and humorous illustrations. 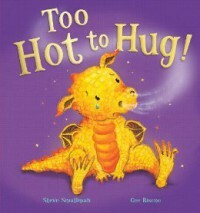 Prepare to meet the most adorable dragon ever in Too Hot to Hug! by Steve Smallman. A little boy named Ryan is searching for firewood to keep is family warm during the winter. He soon finds a cave a discovers a big, golden egg. 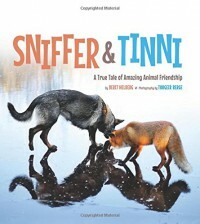 Prepare to be taken on an amazing journey of friendship in Sniffer & Tinni: A True Tale of Amazing Animal Friendship by Berit Helberg. Torgeir Berge and his German shepard, Tinni, loved to go for walks by the forest. During one such walk, something emerged from the bushes. A startled Tinni soon discovered that it was a baby fox! The fearless fox thought that Tinni would make the perfect playmate...and quickly pounced on her. After having his fun, Tinni and Torgeir headed for home. A few days later, Tinni and Torgeir went back to the spot where they had met the baby fox. Sure enough, the fox popped out of the forest ready to play with his new friends. Torgeir was concerned about the fox and knew that the babe should not be without his mother. Torgeir decided to leave food for the fox to make sure that he would not starve. Tinni and Torgeir began to visit the fox every day. Torgeir even gave the fox a name: Sniffer. Sniffer and Tinni's friendship continued to grow, but would their obvious differences come between this dynamic duo? This is officially my new favorite children's picture book! The photographs by Torgeir Berge are absolutely stunning! The reader can actually see the friendship between Tinni and Sniffer unfolding. I am always drawn to true stories, which makes this book even more fantastic for me. I was greatly reminded of the Walt Disney classic The Fox and the Hound. The relationship between Tinni and Sniffer is truly reminiscent of the bond between Copper and Todd. I am very glad that Torgeir encouraged this unique friendship and was able to capture it on film. I would highly recommend this book to readers, animal lovers and photographers of all ages. Readers will easily become swept away by the amazing adventures of Tinni and Sniffer. This story is sure to become a new children's classic. 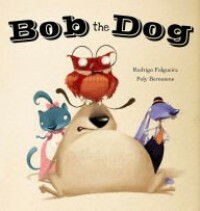 In Bob the Dog by Rodrigo Folgueira, a little boy named Mark takes his dog Bob out for a romp in the park. They are having such a wonderful time! The pair are laughing and running without a care...until a tiny canary flies into Bob's mouth. Bob is beside himself with guilt. He cannot believe that he has just eaten a bird! Mark soon discovers that the canary (named Jeremy) is alive and well...and hiding from something. Mark enlists the help of his woodland friends Roger the Rabbit, Cathy the Cat and Oscar the Owl. Surly, they can come up with a way to get Jeremy out of Bob's stomach. But what if they can't? Will Jeremy be forced to live in Bob's tummy forever? I absolutely love Poly Bernatene's illustrations! They are both whimsical and adorable. I especially love all of Bob's facial expressions. I also love how Bernatene uses mixed media throughout the book, such as hiding pages from other books within the illustrations. Adding a pawtographed photo of Lassie to Bob's dog house was a very cute (and hilarious) touch. While I greatly enjoyed the ending, I felt that the resolution to the story came a bit too quickly. I feel that the story could have been flushed out for a least four more pages. Overall, this is a fun read for the emergent reader. 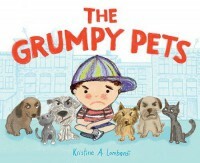 In The Grumpy Pets by Kristine A. Lombardi, Billy is on the quest to find the perfect pet. His search begins at Perfect Pets Animal Rescue. He sees tons of adorable dogs and cats but they are all too....happy. Billy unhappily watches as the other children meet and adopt their perfect pets. He is ready to give up when he hears a noise from a back room at the shelter. Upon entering the room, Billy discovers that it is filled with...grumpy pets! Could one of these animals be Billy's perfect match? I found this story to be a very entertaining read. The illustrations are simplistic, yet charming. I especially love how Lombardi puts so much emphasis on the facial expressions of both the humans and the animals. My absolute favorite illustration is where Lombardi has made the pets to look like their owners. Hilarious! This story has captured my heart for many reasons. I love that Lombardi made Perfect Pets an animal rescue instead of a pet store. Being a huge animal advocate/rescuer, I am thrilled that she is shedding light on the importance of adopting from local animal rescue groups and shelters. I found the characters in the story very easy to relate to. We all know a person like Sara, that perpetual optimist that refuses to see anything but the bright side. And we all have our Billy days when we just cannot shake a case of the grumps. What I loved most about the story is the dual theme of being misunderstood. Not only was Billy viewed as being "grumpy," so were the pets at the back of the shelter. Often times, rescued animals have had very difficult lives with heartbreaking stories of abuse and neglect. They become fearful of humans and are labeled as "unadoptable." What these animals need most is love, kindness and understanding. Through the pure heart of a child, Billy was able to see through the facade of the grumpy pets to the very soul of these broken creatures. In reading the story, I began to wonder if Billy might have some form of Autism. Children with Autism are often misunderstood, which can be quite frustrating for the affected child. Pets are a fantastic way of bringing people of all ages out of their shells. From therapy to service dogs, these pooches are making huge differences in lives around the world. This is a fantastic read that is sure to please children and animal lovers of all ages.